Thursday, September 6th was another red letter day of railfanning for me in 2018. I knew the James E Strates Carnival was set to move from the Northeast to its first southern engagement for the fall season in Danville, VA. I had missed it in 2017 due to the train experiencing severe delays, and I estimated that it would come through my area on a Tuesday again. Imagine my surprise Thursday morning when I saw that the train was departing Harrisburg, PA, having begun its journey the previous night. Thankfully, I only had a morning shift (though to be perfectly honest, I would have cancelled all afternoon plans) and after a quick stop at home to grab lunch and my camera bag, I raced off to Front Royal, VA, to catch up with the train on Norfolk Southern’s H Line. I arrived at the Fairgrounds Road crossing to find a pair of fellow railfans enjoying the usual afternoon parade; both were quite surprised to learn from me that the carnival train was fast approaching. Though I did drive up a mile or so to check out another spot on the railroad, I chose to to the Fairgrounds crossing, which offered a wide open view of the tracks. Hearing the scanner crackle to life, I walked a couple hundred feet up the road to stake out my shot, and waited. The thermometer was nudging 100 degrees Fahrenheit, but thankfully the humidity was low, so standing in the afternoon sun wasn’t entirely miserable. After perhaps 10 minutes of waiting, I finally set eyes on a train I’ve been trying to catch for years; headed by a lone SD70ACu, I began clicking away as the 45 car consist of the last show train in America passed in front of my viewfinder. After returning to my car and performing a short victory dance, I high-tailed it to my next planned photo location of Delaplane, VA, on Norfolk Southern’s B-Line. I waited for a good 20 minutes, and eventually got nervous that I may have missed the train, so I got back on I-66. While driving east, I heard on the scanner that 047 would meet another train at the Gainesville siding. One of my former favorite railfanning spots, I set up shot at the mostly defunct grade crossing near the Cabellas. The lighting angle was awful, so I elected not to photograph the train. Instead, I let the camcorder roll and simply watched the procession trundle past. Much to my surprise, when the last car of the train cleared, I saw the head end of the other train already parked in the siding; I had expected the Strates train would have to wait for a bit before continuing east. I more than likely broke the speed limit as I raced eight railroad miles east to the curve at Powell Junction, on the southern edge of Manassas, VA, where a handful of other railfans were ready and waiting to take advantage of the excellent evening light at this location. As the last few cars of the train passed, a pedestrian waiting to cross the tracks asked me “what’s the point of all this?” referring to us railfans incessantly snapping photographs of what, to her, appeared to be just another boring train. I explained to her that this was one of the rarest trains in the country, only passing through here once a year, carrying carnival rides. I also explained that we are simply nerds, which seemed like a more satisfying answer, if surprising to her. Though I had snapped a picture of nearly every car on the train, I still wasn’t satisfied for the day, and opted to head south for one more runby of the train before heading home. I picked out a spot between Bealeton and Remington, VA, slightly elevated above track level in the hopes of getting a fresh angle on some of the cars. Unfortunately, the light was fading and neither my point-and-shoot camera nor my camcorder were up to the task of capturing crisp images of the train, which was now moving faster on the NS Washington district. Below are three images of the train from this spot, and below that is a link to my YouTube video from this day. As always, thank you for reading and watching! I’m currently sitting on a massive backlog of railfanning pixels to post, and I figured I’d start with the most recent batch and try to work backwards. 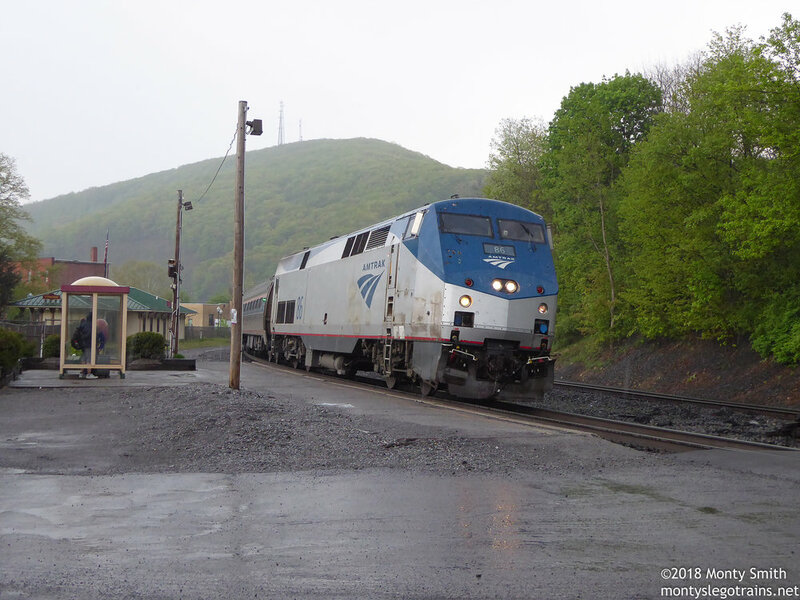 Earlier this year, Amtrak announced that they would no longer operate Charter or special trains, and placed additional restrictions on the movement of privately owned passenger cars, colloquially known as Private Varnish, or “PV’s.” This put the famed New River Train in jeopardy, until the state of West Virginia expressed to Amtrak officials their displeasure with the potential loss of multiple millions of dollars of tourist revenue that the excursion service brings in over the course of two weekends. On that basis, Amtrak agreed to run the train in 2018. In recent years, the train changed from using a mix of private cars and Amtrak coaches to using ALL private varnish, as Amtrak found they were running low on spare equipment. This meant that nearly thirty private cars would make their way from across the United States to gather in Huntington, WV, where the New River Train begins and ends its day-long round-trips to Hinton. However, Huntington is an “intermediate” stop for Amtrak, and the new rules regarding the movement of private cars state that such cars can only be added or removed from Amtrak trains at terminal stations. As a result, this year, most of the varnish gathered at Chicago Union Station, then traveled as a unit with three dedicated locomotives to Huntington, WV (aside from the first leg of the journey, where the consist was attached to the Hoosier State service, which terminates in Indiana). Once the consist arrived in Huntington, some minor switching was performed to arrange the cars in the desired order, as well as add a couple of private cars that reside in Huntington, along with one or two that arrived by freight train. Given the concern that this may be the last year the train operates after a 50 year history, I made my own way to West Virginia to photograph the popular excursion as it passed through the beautiful countryside and the famed New River Gorge. 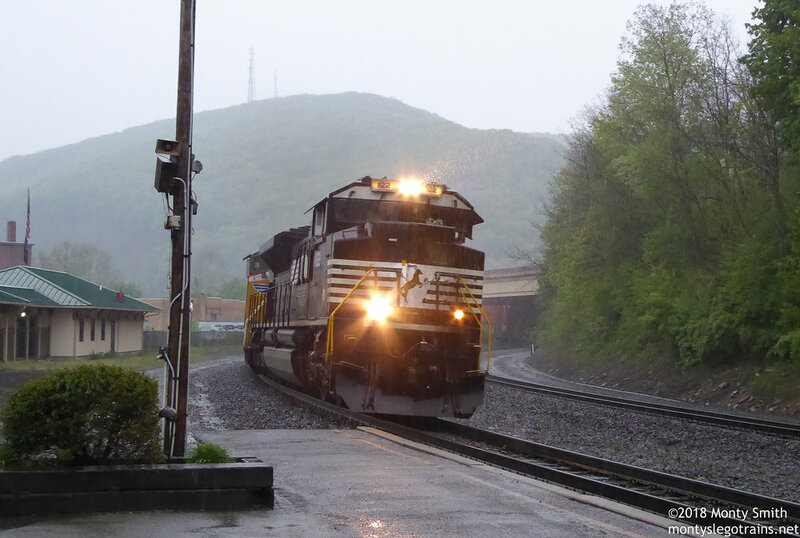 I woke up late on Friday, so not much railfanning was accomplished on the way to my hotel room in Charleston, WV, but I did stop in Alderson to eat lunch and saw one coal train, which had mid-train helpers; both are things I rarely see in my home railfanning turf of Northern Virginia. I woke up relatively early on Saturday to drive 45 minutes from Charleston to my first spot of the day at Barboursville, WV. The drive was nerve-wracking, as road construction put me further behind schedule than I would have liked. Still, I arrived with about ten minutes to spare, and although my still images didn’t turn out due to the cloudy weather, I shot a decent video of the train and got a horn salute from the engineer! The highways do not follow the railroads very well in this area, and experienced railfans advise that chasing the New River Train is almost impossible. Because of this, my second photo spot (and last one of the Eastbound leg of the trip) was in Thurmond, WV; two hours from Barboursville, which required driving on some VERY narrow twisting and winding roads. I arrived with perhaps 30 minutes to spare, and a small group of railfans had already formed a photo line, which I joined. The train was traveling rather slowly through this area, which meant I was able to get a picture of ALMOST every car on the train. Apologies to the J. Pickney Henderson, I was waving to some passengers and came in late on the capture button. While the other railfans departed to continue their chase, I chose to stay behind and photograph an incredibly common, but rare to me, scene: a coal train passing through Thurmond. Although an R.J. Corman employee informed me that a cut of coal cars would be coming down the branch (seen in the lower right of the last photo), I got bored of waiting, and saw no movement on the branch as I drove away from Thurmond. After another hour of stressful West Virginia back-road driving, I arrived in Hinton just in time to see the locomotives coupling up to the other end of the train. This meant I got to view the “egg test.” A few years ago, the organizers of the NRT started placing an egg on the coupler of the last car; the challenge to the engineer is to couple up to the train of vintage passenger cars so gently that the egg does not break. Unfortunately, I wasn’t able to see if the egg survived the ordeal or not. I briefly walked around the Railroad Days festival at Hinton, but I was too broke to sample any of the local foods or arts & crafts. So, I departed for yet more nerve-wracking West Virginia back-road driving to reach my final photo spot of the day at Hawks Nest, WV, where the National Park Service has an overlook of the railroad bridge across the gorge. While awaiting the arrival of the now-westbound New River train, the rumble of an eastbound coal train echoed off the gorge from miles away. The downside was that the coal train went by on the bridge track, diminishing my hopes for capturing the entire NRT in one shot. After the passing of the coal train, more waiting ensued. Tourists came and went, including a gaggle of high school girls taking their homecoming photos, and while I waited I briefly turned my camera towards the many birds flying above the gorge. 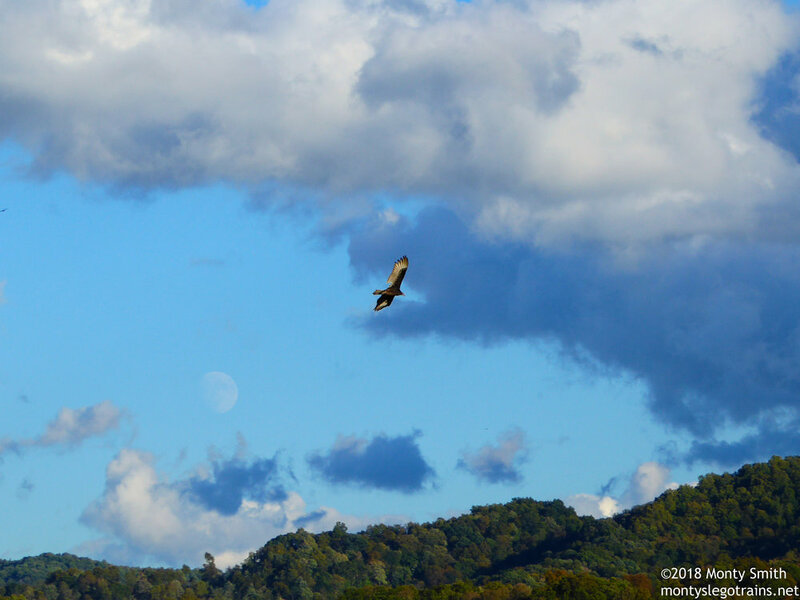 I’d like to say “I GUESS THAT’S WHY THEY CALL IT HAWKS NEST, HAHAHAHA” but… this is a vulture. Finally, after nearly 90 minutes of waiting, a glimpse of headlights through the trees upriver alerted myself and the other railfans to the impending arrival of the New River Train. Getting back to the interstate from Hawks Nest required one more hour of driving back-country roads, and the West Virginia interstates weren’t as well-laid-out as the ones in Virginia. I made it about 3 hours on the interstate before I gave in and took a nap before the final 2-hour push home. A stressful trip, but certainly worthwhile to see a beautiful collection of vintage passenger cars among gorge-ous scenery. While this was my first time seeing the New River Train, I am hopeful that it won’t be the last. A YouTube video is linked below, and as always, thank you for reading! This day's railfanning begin with what I thought would be the highlight catch of the day: Amtrak's Phase IV Heritage Unit leading the Roanoke Regional north into D.C. I had attempted to photograph this engine the previous weekend at Alexandria, VA, but my shot was ruined by the arrival of another train on the near track, blocking my preferred angle at the last second. Thankfully I had a shot at redemption, as the locomotive has been based out of D.C. Union Station's Ivy City shops all week. My favorite part has to be the perfect stripe formed with the Phase IV lines matching up with the Amfleet coaches! Satisfied with two trains, I went home. I got on the computer to edit and upload what pictures I had, and then I saw a heads-up that was exciting enough to make me leave the house again: a train of export locomotives had just left Hagerstown, MD, heading for Norfolk, VA. I've always wanted to catch exports, and with the potential closing of the GE plant in Erie, PA, my opportunities to do so are limited. I was back trackside quickly enough that I managed to see intermodal train 214 with an ex-BNSF PRLX leaser engine, still retaining its cream-n'-green paint, though lacking any BNSF markings. I could hear the export special move, train ID 052, coming east on the B-Line. The train had already taken the siding to meet 214, and was able to hop up one more siding to meet train 12R. After the passing of 12R, I returned to the popular spot of the Manassas Wye, which has the best evening lighting in the area, as any wise railfan will tell you. Sure enough, one had beaten me there, and another showed up shortly after me! We agreed on a spot for the photo line, and were pleasantly surprised by the passage of a low-boy trailer carrying one of the military tanks from the aforementioned special event. Finally, the prize catch of the day arrived at the wye. Hauled by another boring Dash 9 (I look forward to the days when these become an endangered species, to see everyone scramble from ignoring them to getting their "last pics") a set of seven GE TE33ACs on flatcars make their way south from Erie, PA, to the port at Norfolk, VA, for shipment to Ukraine. A YouTube video of today's trains is available below. As some of my video didn't turn out quite as well as I would like, I interspliced some still images with the video to see if that would improve things enough to make it all worth posting. Let me know what you think, and as always, thank you for reading! A pair of SD40E helper engines drift past Alto Tower in Altoona, PA, heading back up the mountain to assist another train down the slope. My morning on May 13th was expected to be a tad bittersweet. As stated in my previous post, the plan for the day had been to chase the now-cancelled PRR E Unit excursion. I was already considering just heading back to Tyrone to perfect some of the angles I shot on my first day, but then I got some interesting news: privately owned Pennsylvania-railroad painted car "Colonial Crafts" (and it's new sibling, Boston and Maine "Salisbury Beach") were heading east on Amtrak's Pennsylvanian. I knew this would afford me a chance at redemption; a rare opportunity to photograph a PRR car in PRR territory! So, I parked in downtown Altoona and made my way to the bridge overlooking Alto Tower, one of the remaining PRR "Cabins" left along the Pittsburgh line. ex-PRR "Colonial Crafts" passes by ex-PRR Alto Tower on ex-PRR rails in an ex-PRR town. I shot no video during this time, thanks to the rain. Once I had this shot, I opted to return to Tyrone to continue working the angles I had photographed the previous day. But first, a magical moment: as I returned to my vehicle, I saw a local freight heading for the branch line that curves off to the left in the above pictures. While it trundled through town, both a westbound coal train and an eastbound intermodal appeared. I had no decent camera angle, so I opted to just watch as three trains passed in front of me simultaneously. Certainly a highlight of the trip! Please be sure to check out my two other blogs from this trip: Tyrone Day 1, and Tyrone Day 2. As always, thanks for reading! Over the second weekend of May 2018, I made a trip to the Altoona area of Pennsylvania. My initial plan was to photograph and chase the PRR E-Units on their final mainline excursion, but unfortunately that outing was cancelled due to new Amtrak policies that stated they would no longer charter trains. In spite of this, my hotel room was non-refundable, so I figured I'd go up anyway and enjoy the weekend photographing the usual traffic on Norfolk Southern's Pittsburgh Line, one of the busiest in the nation. I had planned out a series of photo locations, with the first one being the small hamlet of Tyrone, PA. During my drive up on the interstate, I drove between two massive thunderstorm cells, one on each side of the highway. Upon arriving at the train station in Tyrone, I was greeted by a warning siren going off throughout the town. Concerning at first, but a bit of research showed that this siren was simply a "severe weather" warning due to the storms rolling over the mountains. The rain was on and off, but I still managed a series of photographs. The first train to roll through was manifest freight 11E. It arrived so quickly, I didn't even have time to set up my camcorder! Hot on the heels of 11E was intermodal train 23M, which got slower and slower as it went by. If I understood the scanner chatter correctly, it was taking the third track to meet another train. Behind 23M was train 60N, a steel slab unit train, known for needing many helper engines to get over the grade west of Altoona. By this point, the weather had started deteriorating, and due to the storm clouds, my scanner range dropped considerably. This meant I was unable to identify most of the rest of the trains I saw over the course of the evening, though I of course continued to capture pixels. Continuing the westbound parade, we had Amtrak's Pennsylvanian make its stop at the tiny Tyrone "station" area. While it had rained a bit earlier in the afternoon, it wasn't until after Amtrak departed that the skies really opened up. As such, the next train was photographed from inside the small shelter on the platform. The catch of the day turned out to be this Operation Lifesaver engine, leading yet another westbound intermodal train, which I was unable to identify. Finally, the last three trains of the evening were eastbounds. The fading light didn't afford much in the way of close-up pictures, but distant shots turned out rather well I thought. 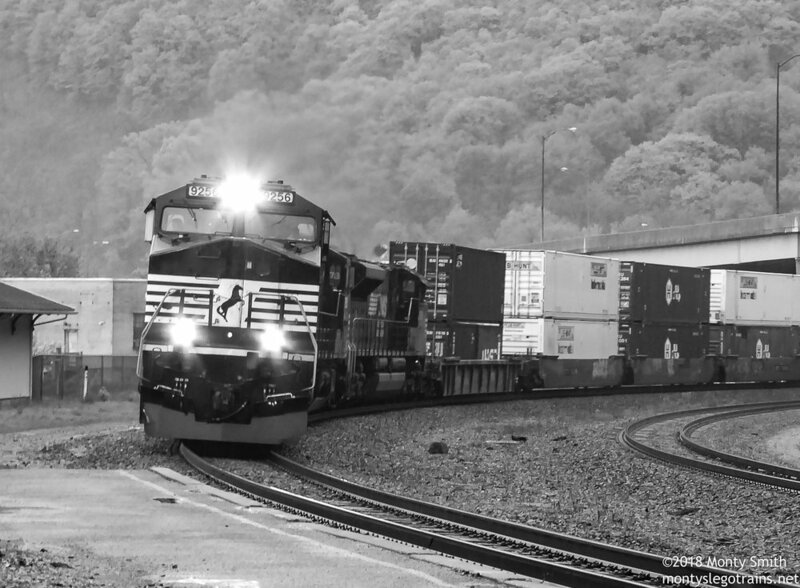 Last train before the light faded on a busy evening along Norfolk Southern's Pittsburgh Line. A video of the Operation Lifesaver unit and one other train is linked below (unfortunately the videos of most of the other trains didn't turn out terribly well). Please stay tuned for Parts 1 & 2 from Day 2 of my Pennsylvania trip, and as always, thanks for reading! Today was a red-letter day for railfanning in 2018! My original plan was to wake up early and take advantage of the Eastern sunlight for a few morning trains. Unfortunately, when my alarms went off at 6:30am, my desire to stay in bed and continue sleeping grossly overruled my desire to go railfanning. I eventually got out of bed at nearly 2pm, and assumed I had missed it all... until I saw online that the Norfolk Southern Safety Train was still in Hagerstown, MD, manifest freight 13R with the Reading heritage unit had only just left Hagerstown, and an empty coal train with the Wabash heritage unit was still sitting in the siding at Gainesville after parking there the previous night. I barely had enough time to grab some water and change positions before 947 came roaring through, hot on the heels of 13R. The crew was very enthusiastic with the waves and with the horn. I wasn't entirely pleased with my images of 947, so I decided I'd leapfrog the train to the curve at Powell Junction near Manassas, VA, which was guaranteed to provide me with some quality evening lighting. Unexpectedly, I also passed train 13R; I saw it from the highway snaking through the curves at Broad Run. I arrived at Powell Junction while the freight was calling the signal at Wellington, approximately six miles away. This gave me a bit of practice with the available light to make sure I'd capture something better of 947, but the images of 13R turned out quite well themselves! 947 was following 13R as closely as possible down the B-Line. As soon as the switch was clear at Powell, the dispatcher threw it to immediately give a high green to the safety special to pass 13R on Track 1. Despite its higher priority, at no point on the B-Line did intermodal train 203 pass 947, even though the dispatching system's Auto-Router kept lining 947 into sidings (apparently this was because it was following 13R a little too closely). 203 had nothing too special for power or cargo, but it did have a very friendly engineer! Not long after 203 had passed, I got a text from a friend that she was ready to meet me for dinner in Chantilly, which isn't far from Manassas. However, there was one more heritage unit in the area that needed photographing. NS train 741, an empty coal re-route, had been parked in the siding at Gainesville for nearly a day, with the Wabash engine second in the consist. I drove around back of the Cabelas near the siding, but the lighting was atrocious. So, I parked up and began walking over to the other side of the tracks, when I was stopped by yet another train! 228 was running later than usual, and roared through Gainesville. I wasn't prepared to photograph it at all, but I still tried for something a little bit artsy. Practice makes perfect! Once 228 had passed, I walked to the spot overlooking the swamp on the opposite side of the tracks from the Cabelas, and found that the engines on 741 were just a BIT too far away and the angle just wasn't quite right. So, I did something incredibly stupid, which was to pull over on the I-66 on-ramp (the traffic was pretty light, in my defense!) to jump out, snap a picture, and jump back into the truck. Was this a poor choice? Yes. Do I still want to get a better shot of 1070, in motion and leading, when I can? Yes. Am I going to check it off my heritage unit list? VERY yes! As always, video is linked below. Thanks for reading and enjoy the pictures! On Saturday, May 19th, 2018, I woke up even earlier than I do on work days to drive nearly 3 hours to Dillwyn, VA. Why? Because after 65 years of service, (33 with its original owner, and 32 with the Buckingham Branch RR) Richmond, Fredericksburg & Potomac Railroad GP7 #101 was slated for retirement. The engine was rebuilt by RF&P in the mid-1980s using the frame from sister engine #104, and was then leased to the Buckingham Branch Railroad. The engine has served both her leaser and the Old Dominion chapter of the NRHS quite well, hauling wood chips and passenger excursions for each respectively, but at long last, the BB has acquired sufficient power to replace the old geep, which will likely be placed on static display in the beginning of June. As a result, a final series of excursion runs on the 17-mile Dillwyn branch were scheduled, and despite the gray and wet weather, I made the trip to see the old engine run one more time. and after about an hour, I reasoned that by this point, the train should have passed me in both directions. My cell phone battery was nearly dead (I had no reception to find out what had gone wrong) so I gave up and opted to return to the depot at Dillwyn, where I found the train had been sitting for a time. It turned out that the excursion encountered high water just a mile or so from my location, and reversed direction earlier than expected. Some of my still images hadn't turned out as I well as I would have liked, but I still chose not to chase the afternoon trip; a fairly wise decision, as I later learned that engine 101 experienced a malfunction, and a second diesel was added in front of it to complete the excursion run. Currently, I'm hoping to return to Dillwyn at the beginning of June for a second chance at photographs, and hopefully 101 will be in working order by then, ending its career on a high note! Pictures and video are shown below, and as always, thanks for reading! Afterwards, I doubled-back 10 miles down the single-track line to another point where the tracks split in two, or merge into one for northbound traffic. The entire Washington to Atlanta mainline was double-tracked until the 1980s, when dispatchers and management found that they could make do with alternating 10-mile sections of single track and double track (fun fact: dispatchers were asked to give this technique a try by putting electrical tape over the tracks on their CTC boards. When it was determined that alternating single and double track would work, the tracks were physically removed both from the board and in real life). This way, trains could meet each other without either train having to come to a complete stop. This principle was demonstrated to me at Rapidan, where I watched Amtraks northbound Crescent, running quite late, rip through on Main 2, followed closely by intermodal train 214 on Main 1, which had been overtaken by the Amtrak and was now picking up speed again. I was hoping for a shot with both trains in the image, but thanks to the efficiency of 10-mile double-track, 214 did not have to wait at the stop signal at this interlocking point as I had hoped. Usually, once I've bagged three trains on the Wash, I call it a day. The line only sees ~15 trains a day, most of which pass through at night. However, as I was driving home, now on US 29, I caught a glimpse of 214's tail through the trees, and my scanner (which I hadn't bothered to turn off yet) informed me that the train would be changing crews at Bristow. This would give me ample time to set up a second shot of the train at Gainesville. So, I did! A link to a YouTube video from today is provided below, and as always, thanks for reading! Ever since the VRE roster became completely standardized with the final delivery of the Sumitomo/Nippon-Sharyo Gallery coaches, my interest in photographing commuter trains has heavily diminished. Seeing as they all look practically identical, I find them about as interesting as subways. Having mulled on this for a time, I decided to challenge myself to "Make VRE Interesting Again" by finding some artsy angles and taking some long exposures to jazz up my images. To facilitate this, I made the morning trains my target, both for the morning sun angle AND to take advantage of the darkness before the sunrise so the headlamps and trim lights on the cab cars (which face North, leading the trains for the AM rush) would stand out a bit more. I started out at Rolling Road station, just east of Burke, VA, as I hoped the shorter platform would give me less clutter in front of the lead coach. It kinda worked, kinda didn't. I also opted for long exposures, as short exposures wouldn't take in nearly enough light for the scene. The results aren't stellar, but good enough for me! While I made a donut run in between the 6:08am and 6:48am trains, the natural light went from dark to the pre-sunset "blue hour," which still allowed for some shots accentuating the lights on the platform. After the 6:48am train, I was expecting the southbound deadhead run to pass by well before the 7:08am train, however it actually *delayed* the 7:08am train, as it came down the same main as the Northbound trains, crossing over in front of the 7:08am train at the Burke crossovers just South of the Rolling Road station. Although I had planned to take bridge shot of the 7:08am train, I was now stuck, having waited for my shot of the southbound train, which didn't even turn out that well. Nevertheless, I made the best of a less-than-ideal situation and tried what I did on the 6:48am train, but with slightly better lighting. Next, I walked up to the Rolling Road bridge from the station, which took about ten minutes. I really wanted a straight-on nose shot of the orange striped cab car leading the train towards DC. As you can see in the first picture of this blog, I captured one good shot with the blue engine still rounding the corner; a nice contrast to the silver Gallery coaches. In this shot, the whole train is gathering speed on the straightaway. I also tried a trestle shot at Lake Accotink, but the clouds were uncooperative, so I'll have to try that one another time. Thanks for reading, please enjoy the pictures! My early morning on November 12th, 2017 was spent documenting Southern Railway #4501 as it departed Grand Junction, Tennessee, bound for Georgia. After the steam excursion left, I found myself in a quiet yard full of historic railroad equipment. I immediately set my sights on Tennessee Valley Railway Museum's fine collection of ex-Southern diesels, which includes SD40-2 #3170. This engine was restored to its Southern paint scheme by successor Norfolk Southern, and shortly was donated to TVRM after about a year of it running around the modern NS rail system. Rumor has it the engine needs a bit of mechanical work, but externally it is in gorgeous shape. My stroll through the display yard was then interrupted by the arrival of TVRMs Missionary Ridge Local, the passenger service that hauls tourists 3 miles up the line to the East Chattanooga depot and Soule shop complex. I sprung the extra $20 for a cab ride, and was welcomed into another beautifully restored locomotive on the TVRM roster. Tennessee, Alabama and Georgia Railway GP38 #80 was recently purchased at auction from Norfolk Southern, and repainted into its original colors. The engineer was a delight, and so were the sights and sounds from the cab as we rolled over multiple bridges and through the Missionary Ridge tunnel. I declined the option to leave the cab to join the tour group inside the Soule shops, which I slightly regret as I could have seen Southern E8 #6914 under restoration. However, I did get a shot of a couple more ex-NS engines, including Southern #5000, the first GP38-2 bought by the railroad. After my cab ride, I spent a chunk of dollars in the gift shop, and aimed my camera at a few more interesting pieces of rolling stock in the yard. The crown jewel shot from the day was the upward-nose shot of Southern GP30 #2594. I had many books on railroads as a young child, and a similar picture of another Southern GP30 really captured my imagination back then, and perhaps helped spark the Southern as my favorite railroad. Admittedly, I had to climb a bit on the adjacent GP38-2 #5044 to get the right angle, but the results were worth it! Once I had my shots, I reluctantly returned to my truck and set out for the 10 hour drive home. My Southern trip had been a considerable success, and as I drove out of the parking lot, I was already plotting my eventual return to this part of the country. There's plenty more railroading to see down here, and I brim with anticipation as I think about my next journey to Southern territory. Look ahead, look South! Veterans Day 2017 was another red-letter day for railfanning in my book: I finally checked another steam engine off my list. Southern Railway #4501 is 2-8-2 Mikado type engine, and was the first engine to pull excursion trains in the Southern Railways steam program that began in the late 1960s. 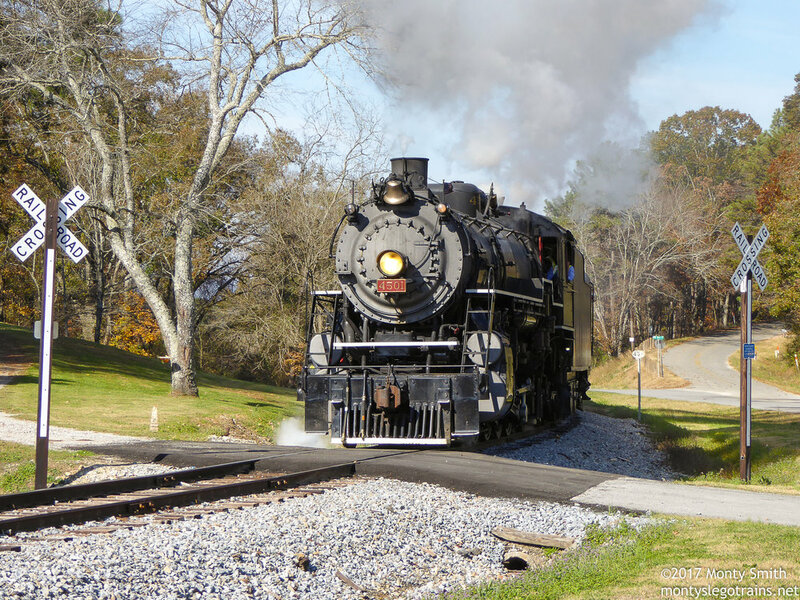 When Norfolk Southern ended the steam program in 1994, engine 4501 returned to its home at the Tennessee Valley Railroad Museum and operated for a couple more years until it reached the end of its FRA certification. Because the museum had two other perfectly functioning steam engines, overhauling 4501 was not a priority for well over a decade. However, in 2011, Norfolk Southern revived its steam excursion program, and sought the use of TVRM engine 630 as part of the lineup. 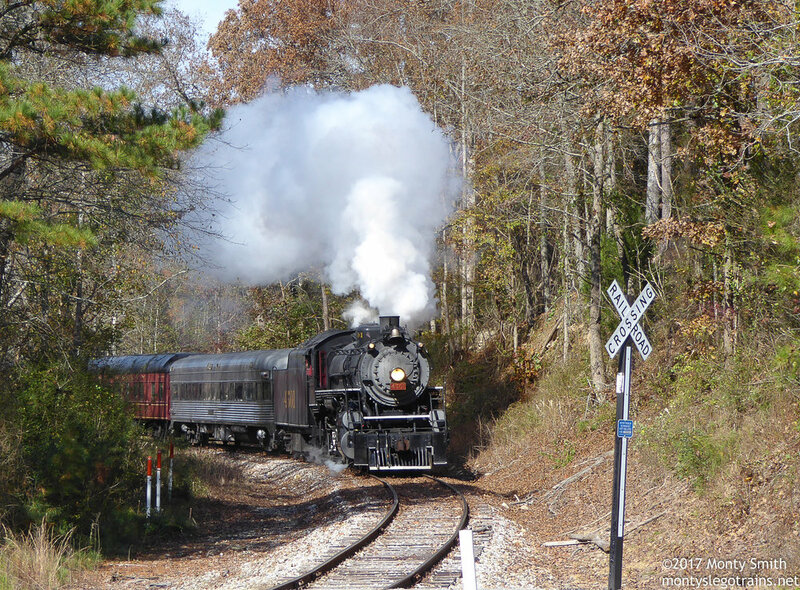 Seeing the opportunity to run their larger steam engine, TVRM began work to restore 4501 in time to participate in the 21st Century Steam excursions, and the locomotive came back to life in late summer of 2014. The engine participated in the final year of Norfolk Southern's 21st Century Steam program (2015), and now lives a life of considerable leisure, hauling tourists on the 3-mile line within the museum grounds, and occasionally pulling longer excursions down the Chattanooga & Chickamauga Railway to Summerville, Georgia. Capturing one of these longer excursions was the main purpose of my trip to North Carolina and Tennessee in November of 2017. From my hotel room across the river in Chattanooga, I could hear the mournful whistle of 4501 echoing across the valley. I knew that the train wasn't scheduled to leave until 9am, and these whistles I was hearing at 8am were merely the engine running from the shops at East Chattanooga to the boarding platform at Grand Junction, but I still raced through breakfast and hurried down to my first spot of the day: just outside the southern portal of the Missionary Ridge Tunnel, a pre-civil-war engineering marvel. I was joined by a handful of other railfans who had made similar multi-hour journeys to view this gorgeous steam locomotive in its natural habitat, and we were treated to an incredible show as the old Mikado blasted out of the tunnel. Up until this point, my only experience with chasing steam excursions was with N&W 611, which runs the full 40mph permitted by Norfolk Southern for old equipment on their mainlines. As such, I raced ahead to my next spot on the southern edge of the Missionary Ridge. I waited for a few moments, and then became concerned that I had missed the train, and once again drove like a maniac to reach my third scheduled spot of the day in Rock Springs, Georgia... where I waited for well over half an hour for the train to show up. The line from Chattanooga to Summerville is fairly well maintained, but 4501 prefers to maintain a slower pace to give passengers a smoother ride. Rock Springs is a popular photo spot thanks to the S curve ending next to an old abandoned house, and a grade crossing with two crossbucks instead of modern flashers and gates. This made a nice frame as the old engine roared through, with the whistle clipping the mic on my camcorder! My game of leapfrog continued, and I landed at my fourth spot, south of Lafayette, Georgia. This location had a modern crossing system, complete with electronic bell; a sound which provided a stark contrast to the brass bell and steam whistle of the 4501. I was also able to pull off a zoom-shot of the engine approaching through a tree tunnel of sorts. In the first picture, you can see an arm waving out of the cab of the engine. This is because some dingbat of a woman was standing IN THE GAUGE behind me to get her own shot. After the train had passed, she asked me about any good spots with tree tunnels and curves in the area. I had to reply that I didn't know, for two reasons: Firstly, because she was clearly an idiot for standing in the gauge and I didn't want to help her continue to be an idiot, and B: because I only had my spots for the day listed in my GPS as "Spot 1 South, Spot 2 South, Spot 3 South" and so on, and I had no idea what the next location actually looked like. However, it did turn out that my next spot had the two ingredients she was after: tree tunnel and a curve. And a crossing for some whistle action, to boot! A couple of video-only locations later, I arrived in Summerville, GA, to a COMPLETE madhouse. There was some sort of Veterans Day festival centered around the arrival of the steam train, and I found myself trying to shoot video while surrounded by people who had zero respect for anyone with a camera. I could slightly sympathize as most of these people were....well, normies... not railfans, and therefore weren't familiar with concepts like the photo line. On top of that, the lighting was absolutely terrible while the engine was on the turntable. Given that I was hungry, and my truck was thirsty (and so was the steam engine, as it was taking on water from a fire hydrant when I left) I frequented the local Bojangles and gas station, then set up for my next shot at the bridge in Trion, GA. By this point in the day, the sun was almost directly overhead, and the lighting on either side of the bridge wasn't particularly good (note that the face of the engine is in shadow) so I took the opportunity to make a few roster shots of the historic passenger cars in the train. After snagging this beauty, I made a couple of unscheduled stops; the first was a spot along Missionary Ridge that I had tried in the morning, but chickened out as I thought I had missed the train. The second was a crossing near the run-down industrial district of Chattanooga, where a nice open field provided a backlit shot of the engine nearing the end of its run. Finally, I arrived back at the depot in Grand Junction, yet again a bit far ahead of the train. Thankfully, the depot is situated adjacent to a busy Norfolk Southern mainline, and I was treated to the passing of a couple of freights while waiting for 4501 to arrive. The engine spun its drivers a bit on the sharp grade at the east end of the depot, and immediately upon arriving, the museum's Tennessee, Alabama & Georgia Railroad GP38 went to work switching the passenger consist for the next day's steam special. At this point, I was entirely out of camera batteries, my phone was almost dead, and I was unbelievably tired after 11 hours of train chasing. I stopped at a steakhouse on my way back to the hotel and had a very pleasant meal to cap off a wonderful day of railfanning. The next morning, I had planned to actually visit the grounds of the Tennessee Valley Railroad Museum, but I arrived early for one more look at Southern 4501 before it departed for Summerville again. The TAG GP38 had clearly been busy with the coach consist, as the entire train was now Tuscan Red, rather than a mix of paint schemes. As much as I prefer a mis-matched consist on an excursion train, I was VERY tempted to chase the train through the rolling Georgia countryside again, but time would not permit it. So, I settled for a variety of close-ups on the engine, and a short video of the train departing Grand Junction. As always, thank you for reading and enjoying the pictures and video! Strasburg 89 has its tender topped off for the days runs. The engine will use half a ton of coal on each 4.5 mile round trip from Strasburg to Paradise and return. For the second weekend of October, I opted to treat myself to a mini-vacation. With school back in session, my teaching workload has increased, and I decided I could use a little break. So I headed up to Strasburg, PA to take the Hostling tour offered on Friday mornings during the warmer months of the year. I was hoping for number 90, or perhaps 475 one more time before it goes down for its FRA 1472-day overhaul. Instead, I was treated to number 89, which recently returned from its own overhaul, having last operated several years ago. While at first I wasn't entirely thrilled, I quickly warmed up to the cute little Canadian engine and found it to be very photogenic! During our tour, the yard crews were busy arranging the day's freight delivery, as well as shuffling historic freight and passenger cars in preparation for the weekend runs. This meant we were treated to a couple runbys of 8618, an ex-NYC switch engine that is typically used to haul the freight on the Strasburg Railroad. I also had the good fortune of a brief cab ride while 89 pulled 90 out of the enginehouse! 90 had just had its fire lit in preparation for running trains over the weekend, while 89 would be taken out of service after today's trips for some minor maintenance. But for now, the little 2-6-0 was fired up, and we got to watch as the crew blew down the boiler, blew out the stack, and wiped the engine clean for a day of hauling tourists in the Amish countryside. Please enjoy the pictures, thanks for reading, and be sure to check out my next blog from the Railroad Museum of Pennsylvania, located just across the street from the Strasburg Railroad. N&W 611 charges upgrade alongside Norfolk Southern train 29G. May 27th was another red-letter railfanning day for me. In 2015 and 2016, the group that operates N&W 611 had brought the magnificent J class up to Manassas, VA (near my home) to operate excursions on the B-Line to Front Royal, VA, and back. However, for unknown reasons, this excursion route was excluded from the 2017 season. So, I packed my bags and happily drove the 3 hours to Roanoke, VA, to see the engine in the habitat it was built for! Saturday would be spent chasing the engine for the full day, and I had purchased a ticket to ride on Sunday morning, followed by more chasing in the afternoon, until I had to head home for work on Monday. For the Saturday morning trip, I caught the train at four locations; Webster, Lowry (in both directions), in between Thaxton and Montvale, and Bonsack. Webster was crowded with people, which made for good conversation while waiting for the train toarrive. Then it was a far race ahead of the train to secure a spot directly over the tracks on the road bridge at Lowry. After the eastbound run passed underneath, I opted to stay and photograph the train from a different angle, and managed to get some practice as NS train 22A rolled through ahead of the excursion. I don't normally run as soon as the engine passes, but in this case, I was anxious to get west of Thaxton to photograph the engine on a banked curve there. I arrived seconds before the crossing activated, snapped my shot, and then ran back to my truck to again race ahead of the train to Bonsack, where I wanted to redeem the reverse curve video shot I bungled last year when my tripod broke. Thankfully the excursion hit a slow order on the way up the grade, so I ended up with plenty of time to wait, but of course, hindsight is 20/20! Rather than fight with the traffic in and out of downtown Roanoke, I instead opted to head back to the hotel for a short while, then I hit up a local Chik Fil A for lunch. My first choice of spot for the afternoon trip was more overgrown with vegetation than Google Earth had suggested, so instead I opted for a long straightaway where we could see the train coming from miles away. Next stop was quite a ways away at the Montgomery tunnels, and I had this silly idea that if I got there early, I could beat the crowd. BOY was I wrong! There had to have been at least 150 people there, and one of the locals got so angry she walked in front of peoples cameras when the train came. She also remarked that she would block off the gravel area in front of her house, claiming it was her driveway (although in reality, much more of it was railroad property than she might like to think) and forbid people from photographing the train at that spot. Several railfans kindly informed her that an entirely different crowd would be back three more times over the course of the weekend, and then we all beat a hasty retreat. I made my way to the Ryan Road grade crossing, one of my favorite locations I caught the train at last year, and waited over an hour for the return trip to arrive. I then improvised, trying out a bridge shot I had seen from US 460 on my way west, and then one more grade crossing to top off the day. I awoke with great excitement on May 28th, which quickly gave way to considerable panic. I had a ticket to ride The Powhatan Arrow behind N&W 611, a lifelong dream come true, but when I went to my truck to drive downtown, I found myself with a completely flat rear tire! Thankfully, UBER came to my rescue, and I arrived at the O Winston Link Museum (formerly the N&W passenger station of Roanoke) with about half an hour to spare. I had splurged for a dome class ticket, and found an empty seat across from a kind man from Canada, who was a railway engineer himself! We were quickly joined by a woman and her nephew (I think) and one couldn't ask for better seatmates. Our car hosts brought breakfast snacks and drinks for us, and gave a briefing about safety and the excursion equipment, and then we were off! Our excursion took us past the Virginia Museum of Transportation, offering an angle on the equipment displays that one doesn't get by walking around the museum grounds. We then charged up the Blue Ridge grade, with an excellent view of the scenery and the engine from our dome car. "Summit View" was originally built for the Santa Fe, and went through several private owners, including Auto Train, before landing in the hands of Iowa Pacific, who have done a beautiful job restoring the car. I was surprised to find electrical outlets available at our table, and kicked myself for not bringing a charging cable for my phone, which was almost completely dead. The excursion went by with only one hitch: our engineer seatmate, who was facing forward, observed an automatic signal dropping to red just before 611 passed it, which prompted an emergency brake application from the crew. Backing up to clear the block resolved the issue, and we continued on our way back to Roanoke. After we had turned in Lynchburg, I wandered several car lengths down to Warriors Rest, a commissary car that was being used as a mobile gift shop for 611 swag. I purchased a poster and some candy, then made my way back to my Dome Class seat, noting that many of the coach seats were empty. The 611 group had changed the Monday morning excursion to a Radford trip, same as the afternoon runs, and it was easy to see why, as not many coach tickets had been sold. Of course, part of the excursion experience was spotting railfans along the way (we of course did our duty and waved back), and we saw many photo lines and vehicle chasers, including a gorgeous pink Cadillac we saw several times. The four hour excursion simply flew by, but the experience was worth every penny. After getting off the train, I joined the throngs of people walking down to view the engine that had just pulled our trip, and not only managed some clear photographs of the J, but several shots of our outstanding rolling stock. After my long-awaited excursion trip in the morning, I snapped back to reality for the afternoon, and called AAA to add some air back to my tire. They arrived quickly, and I managed to arrive at my first photo spot of the afternoon with time to spare. I was greeted by NS Train 29G, and thankfully I kept my camera rolling for the whole train, as 611 came charging around the curve alongside the rear half of the train! The two trains continued to play leapfrog up the mountain, and given my damaged vehicle, I opted not to chase all the way to Radford as initially planned, but instead sit and wait at a road crossing west of Shawsville, and waited for the return trip. Sure enough, I could hear air hissing out of the tire, which solidified my decision to stay put. Train 50V rolled by, nothing but empty covered hoppers destined for another load of grain out west, and then something peculiar; Hotshot train 201 came VERRRYYY slowly around the corner, and then stopped east of the crossing, shutting of its lights. A bit of investigation on Facebook train groups told me that all rail traffic had been halted around the excursion for safety. Not long after, the steam train returned and gave 201 a hearty wave as they passed. I did my best to get a shot of the train coming into view, then raced backed to my camcorder to pan-shot the engine as it passed. Of course, you can't beat the train, and my failure to pan smoothly is evident. I then leapfrogged the special one more time, opting to try and get the whole train in shot one more time at the Elliston straightaway. I didn't quite get the whole train in the image, but if I might be so bold as to quote O Winston Link "Oh, what a picture I got!" I ended up spending the night in Roanoke, as my rear tires both needed complete replacing, and I arrived at the shop too late to have the work done. I had hoped to catch the engine a couple more times in the morning, but I wasn't quite so lucky. Once my tires were replaced, I decided it was indeed time to head home, even though there was one more afternoon excursion to chase. I had captured all the angles I wanted, I had a great time, and most importantly, I finally got a chance to ride behind Norfolk & Western #611 on the famed "Powhatan Arrow!" As always, please enjoy the pictures above and the video below, thanks for reading! C&O #614, the crown jewel of the Chesapeake & Ohio Heritage Center in Clifton Forge, VA.
On Friday, May 26th, 2017, I made a slight detour on my way south to Roanoke for the 611 Memorial Day weekend excursions. Just a half-hour west of I-81 lies Clifton Forge, Virginia; site of a CSX and Buckingham Branch freight yard, with the Chesapeake and Ohio Heritage Center at one end of the yard. My primary reason for visiting was to see the other "J" class engine living in Virginia: C&O #614. This J-3A class 4-8-4 was built in 1942, and served the C&O for a mere 10 years before being retired. The engine sat in a deadline for decades, eventually moving to the B&O Railroad Museum in Baltimore, Maryland. In 1981, Ross Rowland exchanged Reading #2101 (aka American Freedom Train #1) which had been severely damaged in a roundhouse fire, for C&O #614. The engine was restored for use on the Chessie Steam Specials, then modified for the ACE 3000 coal-fuel experiments, and finally retired from excursion service in the late 1990's after a series of trips on New Jersey Transit lines. The engine sat at the New Hope & Ivyland Railroad for several years, before being moved to Virginia in the early 2000s. It is currently painted for the failed "Greenbrier Express" luxury passenger train venture, and sits exposed to the elements, awaiting its next call to action. Ross Rowland's group is working on plans to run the engine again, and will overhaul the locomotive once a proper mainline excursion service plan is finalized. The rest of the C&O heritage center is comprised of four buildings, two sidings, and a loop of large-scale ride-on model train track.The main station contained offices and a gift shop, which I gladly patronized, acquiring a DVD copy of the Ross Rowland documentary. Adjacent to the station is JD tower, or "cabin" in C&O parlance. I believe this is a replica tower, but I'm not positive of that. It provides a great overhead view of 614, as shown above. In the large freight building is a series of model train displays and smaller artifacts, including an O scale display layout and some large-scale "live steam" models. Especially impressive was a model of an Allegheny; I've visited the real thing in Baltimore several times, but seeing it from 'above' in this way was enlightening. Even in 7.5" scale, it's still enormous. The O scale layout had many detailed models of historic C&O stations, hotels and towers. Activated by a push-button was a 2-10-4 pulling a coal train and a set of E units hauling a passenger train. The last building on the property was a moderately-sized shed, containing maintenance equipment and the large-scale ride-on train. The full-size rolling stock on the track nearest the museum grounds was very well-kept. It included a combine coach, dining car, and a pair of cabeese. The inside of the dining car was set with authentic C&O china, some of which depicted Chessie, the C&O mascot cat. The baggage section of the combine coach had period luggage and shopping boxes, and the seating section had VERY comfortable reclining chairs. Of the two cabooses, one was modern and one was older, and the difference in size (and the size of the people they were built for) were stark. Further back in the yard was unrestored equipment, including several passenger cars, troop sleepers, boxcars, and an auxiliary water tender for 614. Adjacent to the Clifton Forge station building was a fully restored GP7 and flatcar. Overall, the museum made for a pleasant visit; a delightful rest stop not far off the road to Roanoke. On Tuesday, July 18th, I got word that NS train 228 had the Monongahela Heritage unit leading, followed by 35Q with the GoRail engine. I've already caught the #8025, and I'm not terribly interested in SD60Es (which the GoRail unit is), but does one really need much of an excuse to go railfanning? Armed with knowledge, I made my way towards Gainesville just in time to watch 211 pass with a CEFX leaser sandwiched by two NS. Drat! I then witnessed a hy-rail truck get on the tracks and proceed east, which indicated that I had a while to wait before the next train. Once I heard 228 trip the defect detector at MP 19.7, I shuffled down to the Godwin Road crossing between Manassas and Bristow to set up my shot. The sun was almost directly overhead, but I wasn't terribly concerned as, again, I already captured this unit on pixels some months ago. After 228 passed, I opted to take a nap before setting up at Powell Junction for 203. I was a bit nervous standing on the median strip (less concerned about the traffic and more concerned about law enforcement showing up and telling me to get lost!) but it turned out this was a brilliant location, as I got a lovely shot of 203 leaning into the curve at Powell and subsequently knocking down the Approach signal before a crew change at Bristow. Finally, it was time to set up for 35Q. I planned a going-away shot for this train at Gainesville, so I could A: include the green signal in the shot, and B: not show the ugly cab of the SD60E in charge. About five minutes before the train arrived, the crossing experienced a false activation which lasted roughly 30 seconds. I didn't think much of it, and happily photographed and filmed the passing manifest, which came with some extra horn action from the engineer! My original plan was to fade out on the crossing gates going back up after the train had cleared. However, much to my surprise, my camera battery died before the gates went back up. After a good ten minutes of the gates remaining down, I opted to call the phone number posted on the crossing for such situations. The nice woman on the other end took my name and callback number, and I described the problem. Before hanging up, I asked if I could please cross the tracks because my truck was on the other side and I was ready to go home. Unfortunately, I was specifically instructed to NOT cross, as the tracks were "still active" and the woman on the phone was unable to verify that no trains were coming. Thus began a long waiting period, during which I weighed my options. I *knew* that no other trains were nearby, and it was technically safe to cross. However, A: suppose NS police arrived just in time to see me walking through the down gates, and B: if they arrive and the gates are still down and I'm gone, they have my name and callback number, and they'll *know* I walked through the gates illegally. Given that this was my first interaction with the railroad proper, I wanted to be a goody-two-shoes. I also noted that my phone battery was running low, and a lighting storm was approaching from the west. While in the middle of deciding that I would cross "illegally" if my phone ran too low or the storm got too close (some safety decisions trump others, after all!) the gates finally went back up...45 minutes after 35Q had passed. The time wasn't completely wasted, as I did manage to get a couple of artsy shots of the crossing during my wait, and after all, I DID have a good day's railfanning, now with a story to tell! As always, please enjoy the pictures and video, and thank you for reading! On May 1st, 2017, I set out for a historic, but bittersweet, railfan outing. 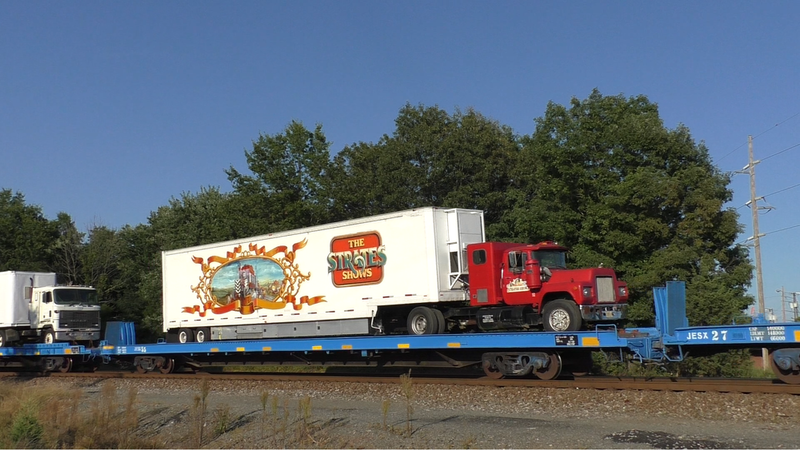 The last fully-loaded circus train would be passing through Washington, D.C., and I had set the whole day aside to chase it south through Virginia. The Blue Unit had just finished its run of shows in Baltimore, and was heading for Charleston, West Virginia, for the second-to-last stand ever in the history of the Ringling Brothers and Barnum & Bailey circus. The Red Unit was in the process of finishing its final shows in Rhode Island, and that train would be split up shortly after the final loadout, with cars being shipped to their new owners, saving for the flatcars which first carried the production equipment home to Florida. The train departed Baltimore in the late morning after several delays with switching and locomotive issues, finally reaching the Potomac River (border between D.C. and Virginia) in the afternoon, after I had spent a fair five hours waiting for the train in blistering sunlight and heavy winds. I have yet to decide if I'll upload my "Circus Train Pre-Game" videos (several other trains through the CP Virginia interlocking adjacent to Long Bridge Park) as the wind was so violent, it nearly took a bite out of my camera multiple times! I actually gaffer-taped my tripod to the railing to ensure that it wouldn't fall over while I was taking still images. This is why I always carry some gaffer tape with me. You never know when it'll come in handy! Without much fanfare, though plenty of attention from the dozen railfans and various park-goers, the Blue Unit entered Virginia on CSX rails, and would soon transfer to Norfolk Southern at Alexandria, only a few miles south. I made the foolish mistake of trying to see the train at Van Dorn Street, where it was scheduled to sit for a few hours before continuing towards Lynchburg and points west. Instead, given that the train was already behind schedule, a brief stop was made to drop off the CSX crew, and then the train highballed out of the yard. I did my best to catch up, but unfortunately the train was late enough that evening Rush Hour traffic had begun, and I soon realized there was no way I would catch up to the train. I wasn't planning on Long Bridge Park being the last time I would see the circus train, but at the same time, I'm grateful I got to see it at all. Two more circus trains would pass through Washington D.C., but both would be devoid of people, merely ferrying equipment back to home base in Florida, stopping along the way to drop off passenger cars heading to new homes. And so, I bid a tearful goodbye to the Greatest Show On Earth, carried by the Greatest Train On Earth, for 146 years of American entertainment. May the Ringling Brothers and Barnum & Bailey circus rest peacefully as we treasure their legacy. Below is a photo gallery and YouTube video link, and as always, thank you for reading! The Red Unit of the Ringling Brothers and Barnum & Bailey circus approaches the Petersburg Amtrak station behind two CSX units. Monday, April 3rd of 2017, was a red-letter day for railfanning in my book. At the beginning of the year, news came out of Florida that Feld Entertainment, parent company of the last circus travelling by train in America, was shutting down both units of the Ringling Brothers and Barnum & Bailey touring circuses, effective in May. Citing declining ticket sales and rising operating costs, Feld felt the shows were no longer financially viable, and made the difficult decision to bring an end to a 146-year-old American tradition. 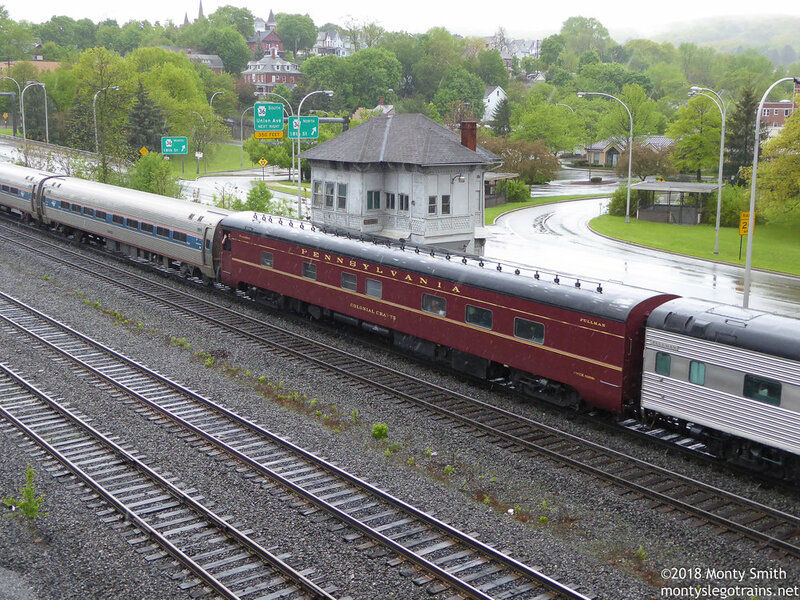 Thankfully, the railfan community stepped up with a plethora of information regarding the final moves of both the Red and Blue circus trains, both of which were reduced to east coast tour dates following the cancellation decision. I made darn sure I got time off from work to see both circus trains one more time, and the Red unit was first on my list. The show wrapped up in Hampton, VA the previous night (see my blog post about the circus wagon loading) and would depart the CSX yard at Newport News for a long trip to Wilkes-Barre, PA. I spent the night at a hotel in Ashland, as the original route called for the train to travel north from Richmond to Alexandria, where it would transfer to Norfolk Southern and travel south to Manassas. However, the schedule changed somewhat last-minute and instead called for CSX to hand the train off to NS at Petersburg, VA, where the train would head west to Lynchburg, then NORTH to Manassas, where it would take the B-Line to the H-Line and exit Virginia for the last time in the wee hours of Tuesday the 4th. After spending a morning at Ashland trying out different camera techniques, I drove south to the Petersburg Amtrak Station, to await the arrival of the circus train. The station agent was very friendly, and every time he passed by to load baggage or speak with other railroad employees, we would briefly discuss the progress of the circus train, which was, as always: slow. The train left Newport News just after 9am, following an Amtrak Regional train, and negotiated its way through the state capitol around noon. I had misjudged the exact routing of the train, and felt foolish that I missed some golden photo ops around the Richmond area, but hindsight is 20/20! Finally, after waiting for a few hours and passing the time with several Amtraks and enjoying the calm quiet of the Petersburg station, I heard the circus train sound off for the nearby grade crossing!